The general opinion is that it’s primarily women who enjoy going on shopping sprees, while guys find it a hassle and try to avoid the experience at all costs. Even if that was really the case, when Nyx asks you to go shopping, you’re bound to say yes. Several interesting features vouch for a dynamic gameplay, and maximum payouts are simply too good to miss. You could end up with enough cash to buy that one thing you’ve been craving forever but never managed to afford – without having to rob a bank. Play Shopping Spree slot machine and rob the casino instead – completely legit! 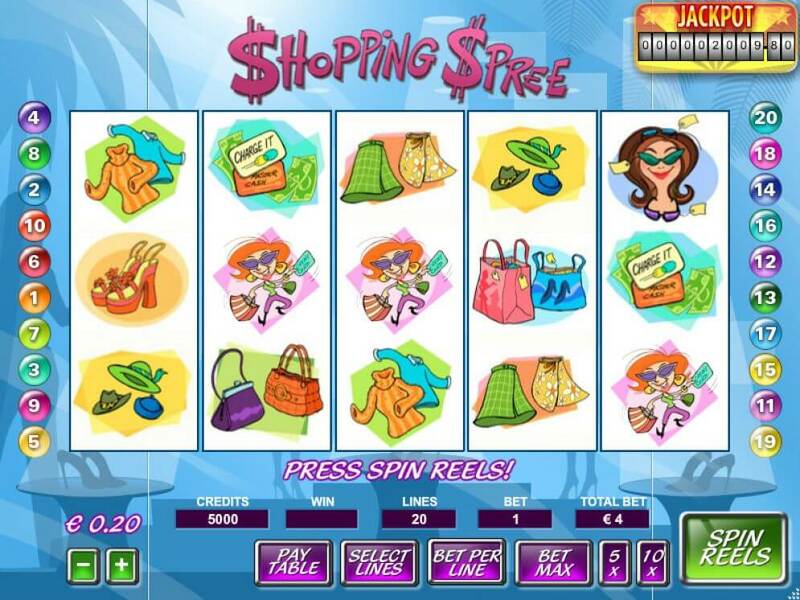 Shopping Spree slot machine comes with 3 special symbols you’ll want to see as often and as many of as possible. Shopper on the run (there’s probably a hot sale nearby) is your Scatter paying up to 700x your stake, while Free Spin icons award 5, 10 or 15 free games, depending on the number of triggering symbols. The slot also features a Shopping Spree bonus game playing on a second screen, exposing you to a selection of clothing items which you’ll need to pick from to claim cash rewards. Picking and clicking go on until the word Collect is revealed, after which you’ll be returned to the initial game screen. Last but not least, you’re additionally being offered a chance to collect the progressive jackpot by landing 5 Wilds or 5 purses on an active payline. Shopping Spree slot has a lot going for it and is likely to appeal to shopaholics as well as those dreading of entering a shopping mall. The game offers a bit of everything – free spin opportunities, instant cash prizes and a progressive jackpot, is widely accessible and comes with a promise of truly substantial wins. Wouldn’t it be nice to go on your next shopping spree in real life and not having to check any price tags?